Kibor Bot Autoclicker :: Version 5.02 The #include directive. It is possible to split the script into different files. Version 5.02 The #include directive. It is possible to split the script into different files. Its purpose is to connect to the script individual files with the source code of the script, copying to the place of this directive the code enclosed in these files. 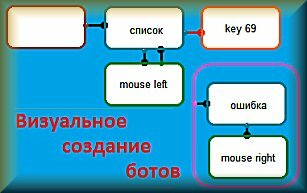 #include "C:\Program Files (x86) \ Kibor \ liba.txt"
In this case, the main script will be available global variables (declared not in the functions ..) of this file and function. Therefore, we must ensure that global variables and functions do not have the same names in different connected files. Goto does not cover this. the contents of the file are inserted into the place where the include directive is specified. messagebox (a); would not deduce to us the value of the variable a, since its assignment would be lower than the output. Where functions and other blocks are indicated is not important. An unlimited embedding of the include directives in the attached files is possible. that is, the file C:\liba.txt can contain include in other files. while in the main script functions and global variables of all files will be available. it is important that the names of variables and functions are not repeated. labels can be repeated.